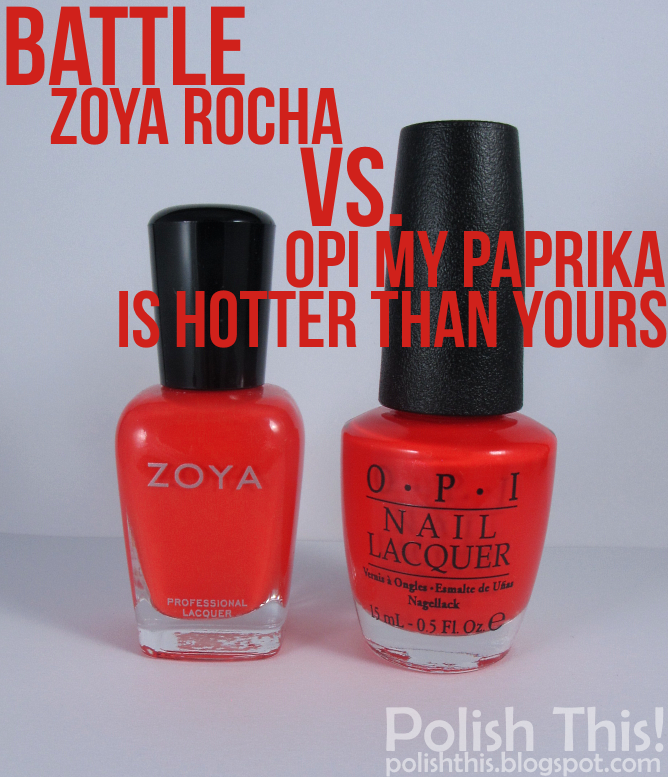 Nail Polish Battle: Zoya Rocha vs. OPI My Paprika Is Hotter Than Yours - Polish This! Ei nuissa nää oikein mitään eroa. Rocha on ehkä hitusen kirkkaampi. Jep, kyllä ne on tosi samanlaiset! I love these battle posts. I favor Rocha by Zoya. Hi Annie, I'm just the opposite of you: I prefer OPI to Zoya in terms of formula. However, some of those bulky OPI names have got to go!!!! I like Zoya's simplicity in naming better. Thanks for the comparison! Yeah, I think between these two you just have to pick the brand you prefer better. I'm totally with you with those OPI names, they're just toooooo long!